Backstage at Y Not Festival in the Derbyshire Dales, the sun is glistening and The Orielles are soaking it up in the far corner of the Artists Area. They are so unassuming - and young - it’s easy to completely miss them in a sea of Dr. Martens and Red Stripe. The Halifax band have enjoyed a massive 2018 so far since signing to Heavenly and releasing a string of their nostalgic indie-pop singles from their debut album 'Silver Dollar Moment', and the buzz behind them is reflected in the huge crowd watching them play this balmy Friday in July. Fusing sunshine melodies with catchy garage licks, the band pay homage to psych bands of the 60s mixed with a Camera Obscura-style sweetness but add something altogether fresh and modern. The trio, 22 year old drummer Sidonie B, her 20-year-old sister singer-bassist Esme together with guitarist Henry Carlyle Wade, 19, have been gigging non-stop this summer and we caught them moments after their main stage debut. You’ve had a busy festival season, how knackered are you? E: We’re pretty tired yeah but we chill out a bit in the week. Although to be honest it’s also helpful to just never stop for a while and get into a flow of keeping yourself so busy it becomes routine. You guys met nine years ago and had your first practice after you met. Esme you and Sid didn’t even play instruments back then did you? E: No we just thought we should start a band. I think it was quite fateful that we met. I mean we just decided it when we were there and then at a family party. I’ve not done that before or anything so to do it at the age of 10 is just weird. S: We didn’t think we would ever play gigs outside of Halifax let alone releasing an album. H: All the surreal stuff that has happened over the last few years has made me think there must have been another kind of reason why we started up in the first place. Did you think at that time you would have had the success you have? E: No way. You set yourself goals as you go along and we’ve met them all but each time it gets bigger and better. H: Well it’s weird though because Esme’s predicted a lot of things that have come to fruition. She predicted we would sign to both of the record labels we have, a year before we were on them. E: I was saying how Heavenly would be the next step and it’s a cool label then we signed with them. You’ll have to wait for my next move… Na I just think maybe when you want something so much then subconsciously maybe that’s what happens. It’s all about the manifestation, like Jim Carrey writing himself a cheque for $10m before he started acting. H: Ha yeah I remember that, perhaps there’s something in it. So what’s next for you after festival season ends? S: We’ll release a new single in October, it’s a cover of a Peggy Gou track. She’s this wicked dance artist from South Korea and we’ve been digging the track for a while. This is an exclusive we haven’t actually tried to do the cover yet! We’ve also recently acquired a new keys player off Trudy and the Romance so this gig was weird because it was the first where we hadn't played with him. We’ve been playing with him in between festivals in our rehearsals and we’re really excited, hopefully the first single will tell everyone the direction we’ll be taking. It must be daunting for him as you guys go way back and have a musical shorthand? H: When we write there’s a real intensity and we don't need to say words to understand each other and we were getting carried away and because he was on keys he was just stood there like WTF. But the last two songs we wrote have been great. E: It is daunting having an album out and then going back to write songs, it’s like when you've gone down a scary water slide and it’s always the second time you go on it is the hardest. Going back to writing tunes now it feels like there’s so much pressure but at the same time we need to try not to compare it. Do you feel the pressure to change things up a bit? E: It’s more that the way we listen to music ourselves is constantly going to be changing and I don't think we’ll put out two albums of the same genre ever. H: We have quite a lot of existential critical conversations about bands and the way we think it should work and the way we think it shouldn't. We’ve always said that bands that bring out either the debut album which is a collection of singles and EPs that we’ve already heard, or the second album that sounds exactly like the first, and we never want to do that because music and art should always be about progression and development over time... like the artist should do at the same time. So it’s exciting moving forwards. So it’s always an expression of who you are in that moment? E: Yeah, it lives and grows with you. H: If we ever reach that point where we are writing two of the same songs we’d have to switch things up massively but I can’t see that happening yet. How do you cope if one of the others doesn’t dig what you are doing? H: If one of us isn't feeling it we will try and find the root of the problem of why they aren’t feeling it and then completely switch it and just try again. E: It’s difficult to get over that step if one person isn't feeling it, if they’re not then they’re not so you need to be proactive and change it up otherwise it will never work. H: We said when we were doing the album that the songs we were most pleased with were the ones with equal input from each band member, you get this equilibrium where being collaborative gave the best output collectively. That’s a lot of long words I don’t know what that even meant. Sounds like you’re respectful of each other’s contribution! H: Well if one person’s not feeling it it gets you down. S: Most of the time when we go back and start again it turns out better. There’s got to be one of you who is the most critical though? H: I’d say Esme because you don’t like stuff with an air of cheese around it and with Sid it’s because it’s not fun for her to play for herself. As soon as there’s a more exciting drum beat she’s loving it. E: Sid’s comments are always so strangely critical as well like the other day she said, "this song sounds way too piratey..." and were like, hmm elaborate...? What about the business side of things, social media and that, do you vibe off it? S: We try not to take it super seriously. We’ve got a great manager who we talk to all the time and he’s really chill and lets us do what we want. We just post what we would enjoy looking at ourselves. E: It’s something everyone experiences feeling, the competition but its so easy to just take a step back and think ‘don’t get phased by it’, we’re quite good at that I think. H: It definitely helps living in different areas and having different social spheres outside of the band, it’s very easy to detach. If we lived in the same house we would get so caught up our egos would be huge. But we always have somewhere to go, and the band is just like if you were into canoeing. It doesn’t take up your whole personality. Have you ever met any of your idols from playing gigs? E: We met The Pastels, they put a show on for us! After a year or so we ended up DJing for them at one of their shows in Glasgow on Henry’s birthday. S: At that same show one of my favourite drummer’s - John Maher from Buzzcocks - turned up, he came from the Hebrides and he got a flight all the way to come see us play. The Pastels tweeted us the first time we played Glasgow about coming to the show and we said do you want guestlist but they said no we’re paying, which made us brick it! Then John Maher tweeted the same and I was like, don’t even talk about it...! E: Our first single 'Space Doubt' had just come out. He said, "I’ve got your first record now you have mine..." and he gave us his copy of the first Buzzcocks record 'Spiral Scratch', probably one of the first pressings of it! 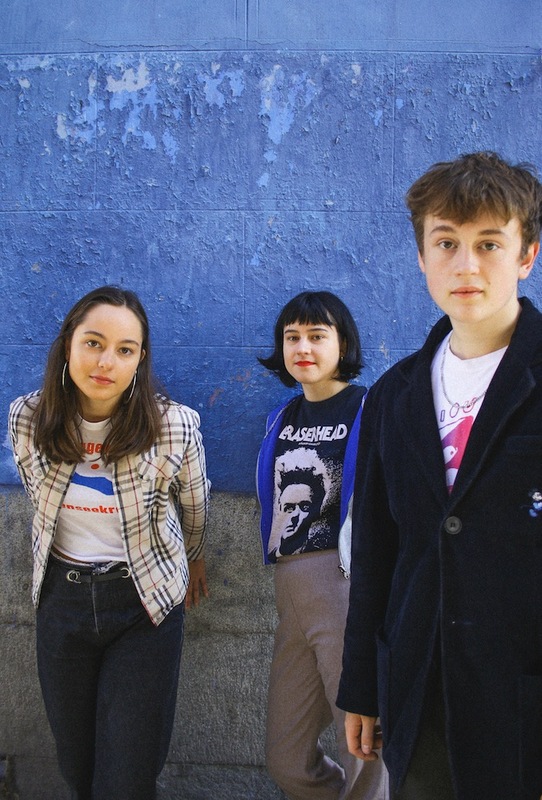 For tickets to the latest shows by The Orielles click HERE.